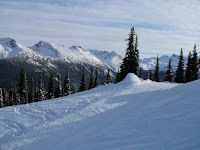 Last weekend was Whistler weekend; the best place to practice my Canadian. Left Friday with the Faker, giving us full days on Saturday and Sunday to be on the slopes. Sunny and cold, the lower runs were pretty crunchy and icy. Groomers were a must. The upper runs were better, but you still needed to guts to go off the runs. Well, guts or edges. The Faker, claiming to have never skied before, cut beginning ski class after 2 hours out of boredom. 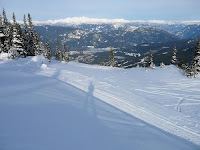 She was skiing blue runs after lunch, and stringing together parallel turns by the end of the day. On 170cm skis. Hence the new ski name.